If you have a group of people, have them line up and run one after the next. At the end of the ladder, each person runs back to the beginning to continue. To make it more challenging, whenever a person finishes the ladder, that person should do some form of rapid footwork while returning to the beginning. The example in the video below shows quick gathering steps being used in between runs. Another extra challenge is that every time someone steps on or kicks a sword, that person must do five pushups at the end of the ladder. The grapevine is a good way to add variation to the footwork. Stand perpendicular to the ladder. Cross one foot in front of the other to step over the first sword, then uncross with the other foot as you go past the next sword. Next, cross the other foot behind to step over the next sword, and uncross as you pass the next. Repeat. Sound complicated? Watch the video below and it will make more sense! This combines the benefits of running with a heavier focus on coordination and balance of the feet. You can also use the ladder for mobile pushups, or what are sometimes nicknamed “Travelling Pushups”, or “Spiderman Pushups”. Start in a plank position with a sword in between your hands. Do a pushup. Move one hand close to the other hand, simultaneously moving the same side foot close to the other for balance. Move the opposite hand over the next sword, allowing the same-side foot to move at the same time. Repeat until the end of the ladder, run back and start over. Crossing two swords gives you four quadrants to work with. You can use the same sword ladder for jumping. Alternately, particularly if you have fewer swords, you can place two swords in an “X”, which creates four quadrants. Stand in one quadrant with your feet close together and jump to the next in a cross-wise pattern as fast as you can. Typically you would do this for a set time limit, such as for 30 second bursts. This type of exercise is good to use in between other exercises for circuit training. To increase the challenge, do the jumps standing on one leg, which will help improve stability. 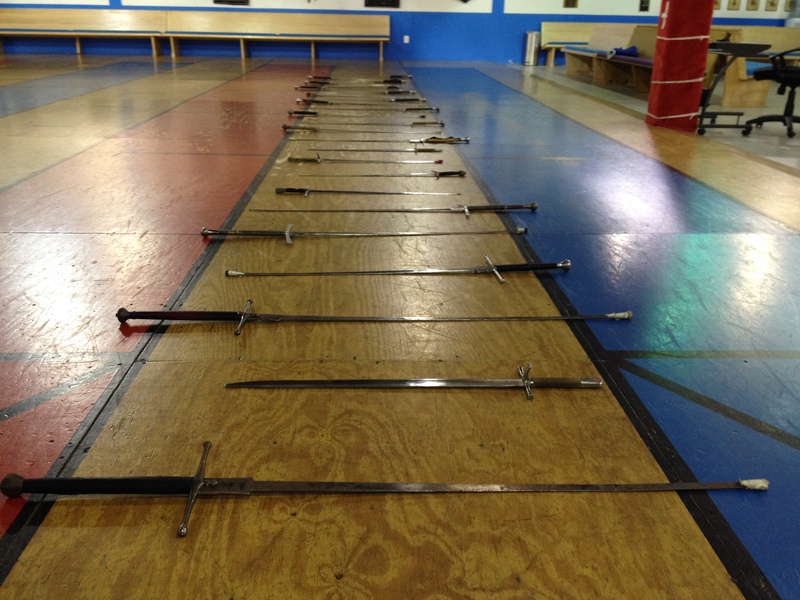 Many types of sword styles practice a type of cross-line stepping, sometimes called traversing or triangle stepping. This type of footwork usually starts with a cross-line passing step, followed by another passing step to uncross the feet, and ending by compassing the other foot to the rear (see the video below). 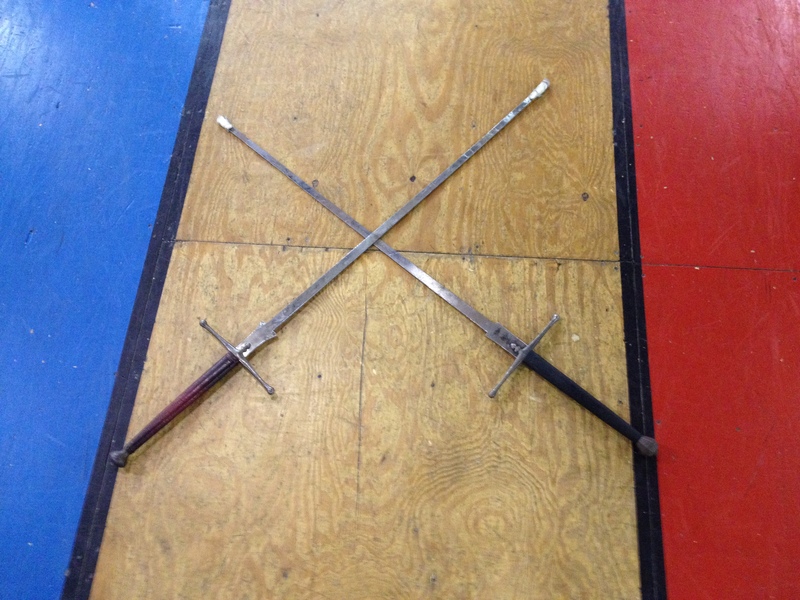 If you take your sword “X”, then add a sword to each side, you can use this footwork pattern by rapidly stepping over the blades with each step. When done at a high speed, this pattern makes for an excellent warm-up. Of course, these are not the only things that can be done with a sword ladder. Play around with it. You can hop on one foot between blades, or crab walk, curve the ladder around into a circle, or any number of other exercises. Be creative, and you will find there are dozens of other versions you can do. ← The Art of Translation, Part 1: What Makes a Good Translation?